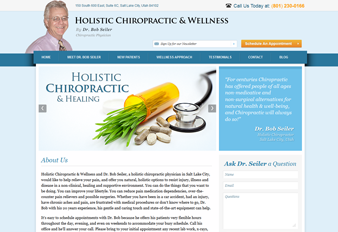 Dr. Bob Seiler is a Salt Lake City, Utah holistic chiropractor who focuses on patient wellness. His practice focuses on natural options that allow patients to treat diseases and illnesses in a non-clinical setting. His professional staff offers a positive and supportive environment that specializes in treating injuries and chronic pain. Their advanced technology helps patients improve the quality of their lives. As an established Utah web design and Internet marketing firm, Adaptivity Pro has made an impressive on the Internet marketing industry. Founder and CEO Eric Morgan started the company in 2004 with the idea of providing the best services along with reasonable rates to clients located regionally, nationally and internationally. Adaptivity Pro has flourished since their inception and with it so has their strong clientele base.